IS THERE AN ANCIENT MYSTERY THAT FORETELLS AMERICA'S FUTURE? 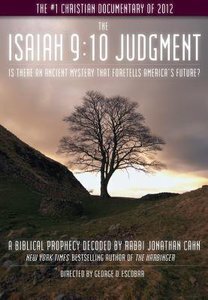 In this stunning new documentary The Isaiah 9:10 Judgment, Rabbi Cahn unravels the mystery behind this seemingly innocuous Biblical verse, and shows that ancient harbingers of judgment are now manifesting in America, just as they once did in Israel. About "Isaiah 9: The 10 Judgment"
Jonathan Cahn's earth-shattering books The Harbinger and The Mystery of the Shemitah became New York Times bestsellers and brought him to international prominence. Known for unlocking the deep mysteries of Scripture and for teachings of prophetic import, Cahn leads Hope of the World Ministries, an international outreach of teaching, evangelism, and compassion projects for the needy. He also leads the Jerusalem Center/Beth Israel, a worship center made up of Jews, Gentiles, and people of all backgrounds, in Wayne, New Jersey. As a much-sought-after speaker, Cahn has been called the prophetic voice of our generation. He has spoken at the United Nations, on Capitol Hill, and to millions around the world.